Marie Kondo has seen your efforts. The Mt Everest-sized heap of clothes that’s taken over your bed, the drawers of T-shirts freshly folded into compact tents neatly lined upright, that once-chaotic kitchen pantry that now looks ready for its debut in the pages of “Real Simple” magazine. The de-cluttering guru, whose organisational philosophy has been drawing attention across the globe since 2011 with her best-selling books, including ‘The Life-Changing Magic of Tidying Up’, has reached a new level of influence and notoriety — and criticism — since the recent launch of her home makeover show for Netflix, now streaming in 190 countries. With the debut of ‘Tidying Up With Marie Kondo’, cleverly released on January 1 for those seeking a reset in the new year, the Japanese author has quickly emerged as a cultural and social media sensation. She has motivated a legion of viewers to watch her Netflix series and clean — good luck trying to evade the before-and-after photos of newly organised closets and sock drawers on Instagram. All the buzz has elevated Kondo to meme-level celebrity, the modern marker of relevancy. Her “spark joy” concept even made the rounds on posters at last week’s third-annual women’s march events across the country. “My team has shared a great many photos and memes with me so I’ve seen them,” Kondo, 34, says through her interpreter, Marie Iida, who has become a celebrity in her own right since appearing on the show. A hallmark of that method, for the uninitiated, can be summed up as such: Keep items that, when held, “spark joy” — a concept she designed to help determine which things you want to carry into your future. The items that don’t spark joy should be thanked and discarded. 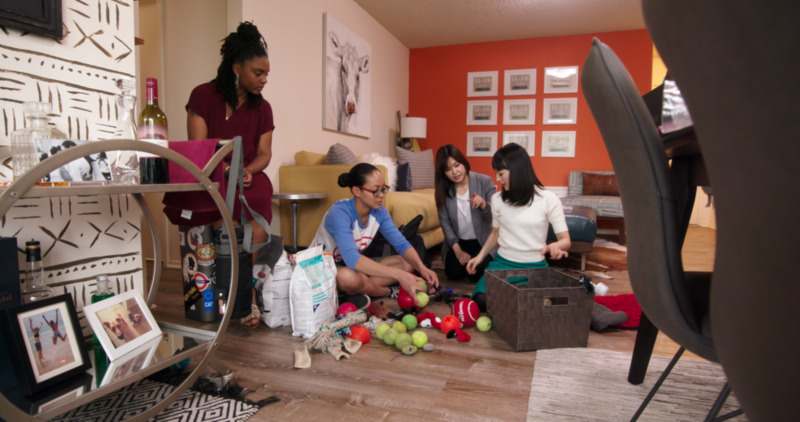 It’s a concept repeated time and again in the series as Kondo helps American families find the joy in tidying. By now, everyone wants to roam the aisles of the Container Store with Kondo or get a peek inside her Los Angeles home, which she moved into last fall and shares with her husband and two daughters. But here we are, sitting inside a minimalist room of the West Hollywood residence that serves as the office space of KonMari’s creative agency, the Outset. Kondo stands out in a gathered black-and-white gingham dress. And it seems impossible, but she’s even more petite and dainty than she appears on TV. She speaks softly but quickly, with graceful hand movements adding emphasis at times, while Iida listens carefully and scribbles onto a notepad to serve up a translation. Kondo will tell you that, when tidying at home, she wears hoodies just like us. She doesn’t have a junk drawer or a secret messy closet — but she will admit that sometimes she lets the laundry pile up. She’s long been on a mission to combat the negative and overwhelming feelings associated with cleaning. Kondo grew up in Tokyo, where her father worked as a physician and her mother as a devoted homemaker. While other kids would enjoy recess at school, Kondo preferred to clean up lockers or spiff up the broom closet. The middle child of three — she has an older brother and a younger sister — Kondo would willingly take on her siblings’ chores. Of course, zealous efforts sometimes got her in trouble — like the time she threw away one of her dad’s suits. She never really thought she could turn her hobby into a career. But when she was in college at Tokyo Woman’s Christian University, she started an organisational consulting business as a side gig when she wasn’t working her full-time job at an HR company. Within a few years, as word of mouth spread and the number of cleaning clients increased, Kondo quit her job. Then came the books, which have now sold more than 11 million copies in 40 countries and helped fashion her name into a verb. TV seemed like a logical next step. The Jackal Group, which produces the Netflix series, acquired the rights to ‘The Life-Changing Magic of Tidying Up’ roughly three years ago. Gail Berman, the chairman and CEO of the production entity, says there were initial discussions about developing it as a scripted series; at one point, she says, TriStar Pictures approached about making it into a movie. That it made its home on a content-hoarding platform like Netflix is a fitting twist. The streaming giant has steadily been building its bench of binge-worthy unscripted programming — its reboot of ‘Queer Eye’ was last year’s success story. Over the course of three months last spring, Kondo visited eight Los Angeles-area families looking to reduce their domestic chaos: There was the empty-nest couple with too many Christmas decorations and just as many baseball cards; a family of four transitioning from a four-bedroom house to a two-bedroom apartment; and a couple expecting their first baby but overwhelmed by a bounty of shoes and clothing overrunning their home — to name a few. In this makeover show, the participants do the work. Kondo sets each family on their journey of wading through items, before leaving them on their own — checking in roughly seven times throughout the process. The length of time it took for each family to complete their de-cluttering mission varied. Recent widow Margie Hodges of Culver City, who appears in the fourth episode, was living in a two-story home filled with belongings left behind from her three grown children and her late husband before Kondo arrived. She found the process to be enlightening, if a little daunting. Kondo’s technique can be jarring to those who feel overwhelmed, or bound, by their possessions. It’s why the chatter about the show is so fervent. While Kondo’s methods have led to criticism and analysis long before the show premiered, a new wave of think pieces has trickled in. Some focus on the way the show reveals a gender imbalance on domestic expectations. Kondo coincidentally wrote a college thesis on the topic of gender and tidying in Japan. “I was actually surprised after the show came out that the same discussions were happening in the US because from a Japanese standpoint, we see America as far more progressive,” she says. Netflix rarely offers insight into viewership of its content so it’s hard to quantify the popularity of ‘Tidying Up With Marie Kondo’ beyond the social media chatter and its noticeable imprint on the cultural zeitgeist. But so far Netflix executives say they are pleased with the response. The question of course is will that spark of joy stay strong beyond these initial eight episodes? There’s been no official announcement just yet. But as we know, Kondo loves mess. ‘Tidying Up with Marie Kondo’ is now streaming on Netflix.